Grades 3-6. We're celebrating the 20th Anniversary of the Harry Potter books with crafts and trivia! 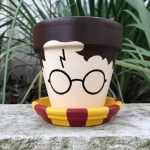 Participants can make painted mandrake pots, wands, and owl letter carriers, while answering some tricky HP trivia questions.